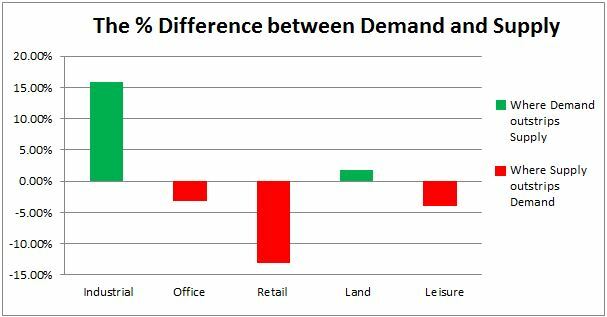 This month, we’ve compared the demand for each of the commercial property sectors in the South West (the percentage of email enquiries in each sector) with the level of supply of each property type (the percentage of properties listed on NovaLoca in each of the property sectors) in the South West and found that demand is high for industrial property, however there is a significant lack of supply in the region. Demand is low for retail properties, which is unsurprising with the amount of retailers struggling recently. Data from JLL revealed that the region is suffering from a lack of stock of commercial property, particularly grade-A space in Bristol City Centre, where stock has dropped by around 2million sq. ft. in 10 years. Alison Williams, Associate Partner at Carter Jonas reported “an acute shortage of quality supply across the office market and limited or no speculative development. Demand has remained strong despite the wider economic uncertainty”. As a result of the lack of stock, commercial property rents in the South West hit a record high of £35 per sq. ft. in 2018. Colliers International reported in Q1 2018 an increase of 19% for prime rents for big industrial units and 16% for prime rents for the secondary market in the South West, which was the highest annual increase in the UK. This rent increase was driven by acute shortages of available Grade A space over 100,000 sq. ft. particularly in Gloucester, Exeter, Plymouth and Bristol. In contrast, according to CBRE, High Street Shop prime rents decreased by 2.5% in Q2 2018, compared to the previous quarter and a further 0.6% in Q3, which was one of the largest rent drops for retail in the UK. This drop in rent corresponds with our findings as a lack of demand leads to rent drops in order to increase take up. On a less positive note JLL reported a drop in enquiries for commercial property in Bristol, particularly in the City Centre, by as much as 10% in 2018, compared to 2017. We also found a drop in enquiries on NovaLoca in the South West of England, despite enquiries across the whole of the UK increasing in general. This could be due to Brexit uncertainty. While there is still demand across all commercial property sectors, particularly office and industrial property and less so for retail, occupiers appear to be cautious unless it is necessary that they move their premises. Alison Williams also stated “that the region is still somewhat behind other UK business and industrial hubs in its efforts to attract investment into these areas. The South West needs to adopt a similar, coordinated approach to business, infrastructure, transport and planning issues to help direct investment, and the businesses that it attracts, to the region”. Read more of our interview with Alison Williams, Associate Partner at Carter Jonas.